RAF. No Evidence / Kein Beweis, by photographer Arwed Messmer. Publisher Hatje Cantz writes: Numerous accounts of the RAF and the German Autumn in 1977 have been chronicled over the past forty years, from journalistic, historical, literary, cinematic, and artistic perspectives. Arwed Messmer begins with the various photographs made by police photographers at the time—pictures of demonstrators, crime scene images, and mug shots. He poses the question of how this past search for criminological evidence can be employed artistically. His narrative strikes an arc from the beginnings of the movement to the multiple eruptions of violence in 1977, the abduction and murder of Hanns-Martin Schleyer, and the suicides of Andreas Baader, Gudrun Ensslin, and Jan-Carl Raspe in Stammheim Prison. Messmer’s work therefore also has an ethical dimension: which photographs can be shown, how can they be shown, and why do we want to see them? This investigation touches a key point in the debate on images that are on the one hand historical documents, and on the other hand embodiments of their own aesthetic with powerful potential for an empathetic examination of history. The “Deutscher Herbst” (German Autumn) has just turned 40. During forty-four days in the autumn of 1977 Germany was gripped in a terrorist crisis. It began on 5 September 1977, when the Red Army Faction kidnapped Hanns-Martin Schleyer, the President of the Federation of German Industries. With his Nazi background and powerful position in the economy, Schleyer represented everything the kidnappers abhorred. They offered to free him in exchange for the release of 11 leaders of its group who were then incarcerated in specially constructed super-prison at Stammheim, near Stuttgart. The German government refused and for the 44 days of Schleyer’s captivity, the country lived in a state of emergency. On 13 October, Palestinian terrorists, who supported the activities of the RAF, hijacked a Lufthansa plane with 87 people on board. They wanted the release of the RAF prisoners too. Five days later, a special task force stormed the plane and freed the passengers. One hearing the news, the RAF prisoners in Stuttgart-Stammheim committed suicide. One day later, the body of Schleyer was found in the trunk of a car. Even today, it is not known who shot him. Nor if the deaths in the prison cells were indeed suicides or, as some claimed, extrajudicial killings undertaken by the German government. The RAF group would only officially dissolve in 1998 but its origins can be traced back to the student protest movement in West Germany in the late 1960s when many young people felt alienated from older generations because of the legacy of Nazism and a suspicion of authoritarian structures in society. Photo archaeologist and photographer Arwed Messmer spent several years in state archives looking for utilitarian and unstaged images taken by police photographers spanning the era between the peak of student protests in 1967 and the autumn of 1977. The photos were taken for surveillance or documentation purposes at rallies, crime scenes and reenactments. Most of these images of Messmer’s RAF. No Evidence / Kein Beweis series have never been published before. He appropriated them for his own artistic purposes, believing that they call for ‘a second look’ that could potentially build up a new image of the era between the peak of student protests in 1967 and the autumn of 1977. As we all know, the way a photo is read changes with the passing years. This holds particularly true when it comes to images linked to politics and ideologies. The images commissioned by the state were once part of criminal investigations and have now lost their primary function as evidence. Nevertheless, they can still offer new types of insight decades after the events. On 2 June 1967, Benno Ohnesorg, a German university student, was killed by a policeman in West Berlin while he was protesting the state visit of the Shah of Iran. The photos of the dying 26-year-old belongs to Germany’s collective memory. The iconic press photograph, taken at the scene, shows a distressed young woman cradling the head of the dying man lying on the asphalt. 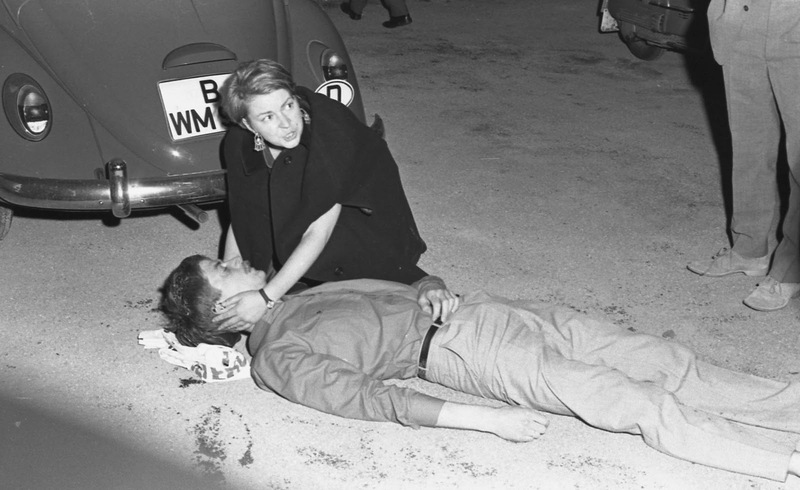 Ohnesorg’s death triggered student protests across West Germany and helped fuel sympathies for the RAF. Messmer uncovered a photo of the same scene but taken from another perspective by a police officer. Instead of the intimate last moments in the arms of a young woman, you can see that the poor man died in front of the flashes of press cameras. The press photographer and the newspaper editors chose an image that would trigger emotion in the viewer, a photo that sums up the event and the suffering. The police photo demonstrates how the visual representation of the crime was constructed. But what the police image also shows is that journalists had to be included in the pictures. They were suspects too, they were potential sympathizers of the protests. To be honest, i wasn’t expecting to like this book as much as i did. My enthusiasm for the book comes from historical curiosity (I knew fairly little about the RAF so i had to catch up on far left protests of the 1960s and 70s) and from a genuine interest in discovering more about how, at the time, the police worked and distrusted. But i think what moved me the most was to realize how little has changed, how terrorists and police alike can use, distort and exploit images to suit their own ends. RAF. No Evidence / Kein Beweis combines 2 books: one containing all the photos and a booklet with the commented captions of the images as well as a series essays that explain the artistic, theoretical and historical contexts of the work. Posted in book reviews, photography, politics. Bookmark the permalink.